Ah yes, the end of the world. That old chestnut. The ultimate curtain call. It seems such a big moment: so conclusive. But the recurrent problem with the end of the world is that it is always nigh, yet never actually happens. Barely a lunar month goes by in world history without some messianic loony leading his followers to the top of a Welsh mountain to await the arrival of the last payoff. But someone always forgets to press the fireworks button. On and on and on goes the foreplay. For 2,000 years now, it has been the biggest stick waved at us, though we haven’t done anything wrong. We’re just messed-up, cranky, weak-willed and desperate post-chimps, muddling through. The only ones who profit from the last weigh-in are messianic loonies, popes and artists. Particularly, the great John Martin. Martin was an end-of-the-world specialist. Between 1812, when he began trying to imagine the end, and 1854, when his own farewell put an end to the ending, Martin was the world’s foremost describer of the final moment. Various talented predecessors had, of course, tried to imagine it before him. Michelangelo himself had a go, across the entire far wall of the Sistine Chapel. 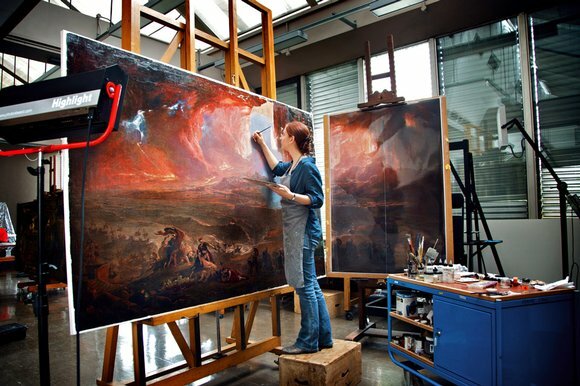 But nothing sticks in your thoughts quite as glueily as John Martin’s visits of the subject. Martin didn’t just make the end of the world feel mighty and convincing, he turned it into a catchy apocalyptic condition, with excellent economic potential. We are dealing here with one of the great shaping visions of modern civilisation. The opening sequence of Dragons’ Den is pure John Martin: big, doomy cityscape; billowing storm clouds over London; with Theo Popit-downalot and Duncan Bal-oneytime looming up at the front of the thunder like Satan Presiding over the Infernal Council in Martin’s great mezzotint of Paradise Lost. All this you will be able to recognise for yourselves when the most ambitious John Martin celebration ever staged arrives in London. The end of the world is coming. And plenty of the astonishing sights on show there will have you chewing your talons with excitement. How does Sadak, the hench hero of Tales of the Genii, manage to climb up that huge rock in Sadak in Search of the Waters of Oblivion? Not even Spiderman could have got up there. And talking of Michelangelo, that famous scene in The Agony and the Ecstasy where Charlton Heston clambers to the top of a mountain and begs God to help him design the Sistine ceiling and the clouds begin to shimmer and throb before forming into a sky-wide approximation of the great Sistine fresco — that is another 100% pure Martin moment. See also the Seventh Plague of Egypt (1823). Or Belshazzar’s Feast (1820). Or The Destruction of Sodom and Gomorrah (1852). When an artist has invented the disaster movie, and 3-D cinema, and Marvel Comics, King Kong, Lara Croft, Star Wars, and Indiana Jones, you expect him to be better known than John Martin is. In his lifetime, every British household that could afford paper had a Martinian apocalypse on its wall. Martin was the best-known British artist in the world. So what happened? Tastes change. It’s that simple. Since his death in 1854 from heart problems, he has been neglected. Sidelined by the Royal Academy in his lifetime, looked down on by art snobs before and since, Martin has been mistaken for a footnote, rather than an important chapter. “Mad” Martin was born in Haydon Bridge, near Newcastle, in 1789, the year in which the French revolution broke out and triggered what many believed to be a countdown to the apocalypse. Martin’s father, William Fenwick Martin, was a lively Geordie wastrel — pub-owner, fencing instructor, cattle-driver, soldier, tanner — who eloped to Gretna Green with Isabella Thomson, a religious fanatic who taught her children that all liars and swearers are burnt in hell with the devil and his angels. The Martins had 13 children: only five survived. The four boys all became religious eccentrics. In 1829, Jonathan set fire to York Minster, screaming: “You blind Hypocrits, you Serpents and vipers of Hell, you wine bibbers and beef eaters, whose eyes stand out with fatness!” He was sent to Bedlam. William Martin, prophet and inventor, who called himself the Philosophical Conqueror of All the Nations, went around Newcastle with a conch shell on his head insisting that the railways were his idea. Richard Martin joined the Grenadier Guards, where he wrote portentous poetry on Old Testament themes. John, the youngest boy, became the world’s leading portrayer of the Day of Doom. Christmas at the Martins’ must have been lively. When Jonathan was put on trial for burning down York Minster, John paid for his defence. By then he had successfully established himself in London after a wonky journey from rural poverty to the Royal Academy. He was briefly apprenticed in Newcastle to a coach painter before signing up with a travelling Italian maestro, Boniface Musso, who did portraits and jobbing landscapes. In 1806, they travelled to London, where Musso’s son had started a glass-decorating business. In Tate Britain’s Martinfest, you’ll see a dinner plate, painted around 1807, showing a huge mountain landscape with rocks, domes, turrets and valleys. Martin must have painted scores, but only this one survives. Painting on glass and china is very different from painting on canvas. On glass, the light shines through the scene from the back and makes it glow. You need to start with the highlights and work your way back into the darkness. Light is the given, darkness the challenge. When Martin realised there wasn’t enough money in glass painting to maintain his family, and began painting pictures, his experiences in glass were all he had to fall back on. Sadak in Search of the Waters of Oblivion, in which our muscular hero, clad only in a loincloth, hangs by his fingertips from a mountain ledge, is so relentlessly red it could be a piece of stained glass. Martin sent it to the Royal Academy in 1812, where it shocked everyone with its crimson vertigiousness. His next picture, The Bard, was set even higher up in the Himalayan sunset. In fact, we are meant to be in Wales, where the last Welsh bard — the chap with his top off holding a harp and waving contemptuously at the English army below — is about to hurl himself into the onrushing waters. From the beginning, opinion about Martin’s work was divided. The public couldn’t see enough. Martin’s most successful picture, Belshazzar’s Feast, went on a tour of Britain — and had reputedly been seen by an estimated 2m people by 1861. The critics, meanwhile, complained about “the absolute tyranny of Martin’s scarlet tone”. Although Belshazzar’s Feast made a lot of money for its owner on its tour of Britain, that owner was not Martin. He had sold it to a former employer and found himself banned from making prints of his most popular picture. With his next epic doompic, therefore, The Destruction of Pompeii and Herculaneum, completed in 1822, Martin was determined to hold on to more of the lolly. “This performance will far exceed Belshazzar’s Feast,” he promised The Morning Chronicle. And it probably did. But for more than a century it has been impossible to tell. Because, in 1869, it was sold to the National Gallery — at exactly the moment Martin fell cataclysmically out of fashion. For decades it was passed around provincial collections. Then, in 1918, it was ceded to the Tate, who put it in the basement and forgot about it. Until the night of January 7, 1928, when the cosmic forces Martin had challenged so arrogantly in his godscapes decided to get their own back. That night, it rained as never before in London. The Thames burst its banks and poured into the Tate. By the time they rescued Martin’s masterpiece it was sodden, covered in filthy mud. A slab of the picture — showing Vesuvius exploding — had floated off towards Greenwich. The painting was deemed “destroyed” and forgotten again. Until the gods intervened, this time on Martin’s side. After a century of neglect, he began slinking back into fashion in the 1970s. And in 1973 another of the paintings presumed lost in the Tate deluge, The Execution of Lady Jane Grey, that virginal fantasy by Paul Delaroche, was discovered under a table in the conservation studio. Rolled up in the middle, in bits, cut out of its frame, was Martin’s Destruction of Pompeii. At the time, it was in too bad a state to make restoration possible. Covering it with a preservative layer of wax and tissue, the Tate sighed a sigh of mild regret and returned it to oblivion. Then two things happened: restoration techniques improved and Martin’s star rose astronomically. Now it is impossible to switch on a games console or see a 3-D movie without noting his influence. A full restoration of The Destruction of Pompeii not only became feasible, but imperative. I managed to inveigle my way into the Tate’s conservation studio, where work on Martin’s lost masterpiece has been going on for a year. The restorer, Sarah Maisey, talked me through the issues. Martin painted on the finest linen he could afford, which was more vulnerable to water damage than cotton. Inserting a new piece of canvas was relatively uncomplicated. The problem was removing the five layers of discoloured varnish in which the remains were caked. Thousands of pieces of loose paint had to be glued back on. But how to do the restoration? Should the canvas be made good and the missing portion left bare? Should the big hole be filled in with carefully coloured painterly blurrings? Or should a full restoration be attempted, with the missing portions repainted, exactly as they were, by Maisey? Happily, the Tate chose the latter. Martin had painted a smaller replica of the picture, which still exists. There was a photograph, too, of the original. So the Tate produced a com- puterised image of the missing portion and Maisey’s task was to copy it exactly. She used a specially developed form of acrylic paint that dries slowly, like oil paint, but is removable. By the time you see it in the show, Martin’s original effect will have been re-created. Vesuvius will again be roaring magnificently over the poor humans of Pompeii and Herculaneum, and those humans will once again find themselves staring into the abyss that lies before them. First, a deluge. Then a resurrection. It’s a good ending.